The Claremont Choir is looking for new members. The Choir’s mission statement is “Music for Enjoyment,” and that’s just what we do! Don’t consider yourself concert material? Don’t worry—we sing for fun and our own enjoyment. There are NO auditions. Just show up and sing! We perform two easy-going concerts a year, and have lots of fun doing it. We also have social events and celebrate the end of each season with a banquet. Choir practice is Monday from 3:00 to 4:30 p.m. in the Great Hall. 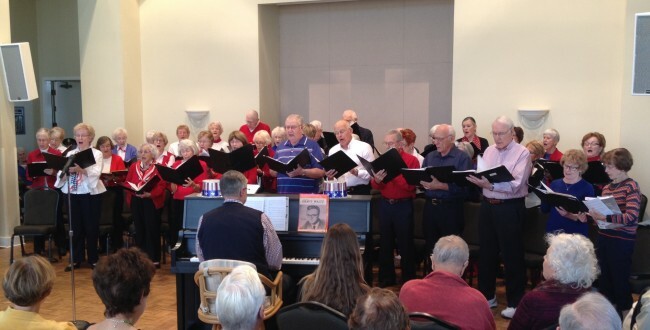 Here is a picture of a very successful and well attended Veteran's Day Concert.